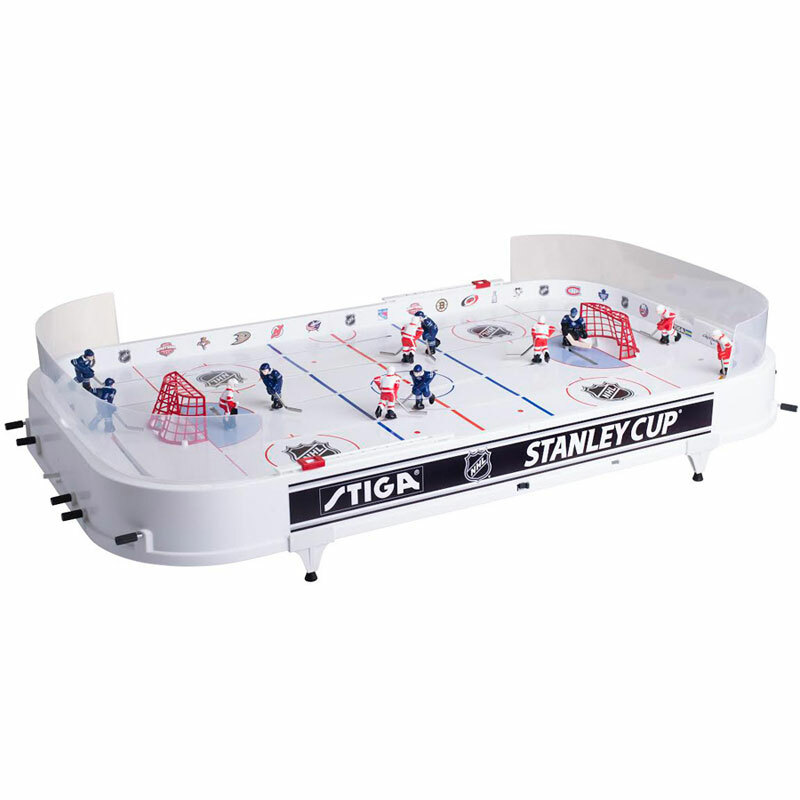 The Stiga ® Stanley Cup Table Ice Hockey Game has 3 dimensional players wearing the uniform of the two major teams Toronto Maple Leafs and Montreal. The teams have been added extra strength as in that the talent scouts have succeeded in recruiting two right-grip marksmen. Together with a left forward that can get back behind the opponents' goal in "the Gretzky position" and a centre forward that can go back into his own zone to build up the attack, there are all the prerequisites for taking your playing standard to new heights. Puck ejectors, plex shields behind the net and goal counters go without saying in the Stanley Cup. Fantastic purchase, easy to set up and has already provided hours of fun for the whole family. Quick delivery from Newitts. Bought for my 9 year old nephew who is mad about ice hockey. He loves it and has already played for hours on this. Well made, great design and although not cheap it is great value for money and keeps kids occupied for hours. Also like the fact that you can buy spares/replacements/different teams at reasonable prices too (should they be needed). Would recommend to anyone who has someone interested in ice hockey - a cool game! Brilliant product. Three teenage boys and dad not stopped playing it since Christmas day along with anyone and everyone who's visited since. The product is also extremely durable. What a fantastic game, hours of family fun. Well build and easy to assemble. Brings back memories of childhood days spent with friends reliving hockey night in Canada. I bought this game for my nephew, had him a game it was great fun. best game out there. great buy !